Find out why Trailer Plus, serving customers across Ontario with new & used dump, utility, cargo, horse & equipment trailers is the only family operated business you need! Located in Peterborough Ontario, Trailers Plus offers trailer sales, service and parts to customers all across Canada. Since opening our doors in 1986 we've proudly served thousands satisfied customers from as far west as Vancouver to as far East as PEI. So if you’re searching for custom trailers for sale in Ontario or anywhere else in Canada, you’ve come to the right place! 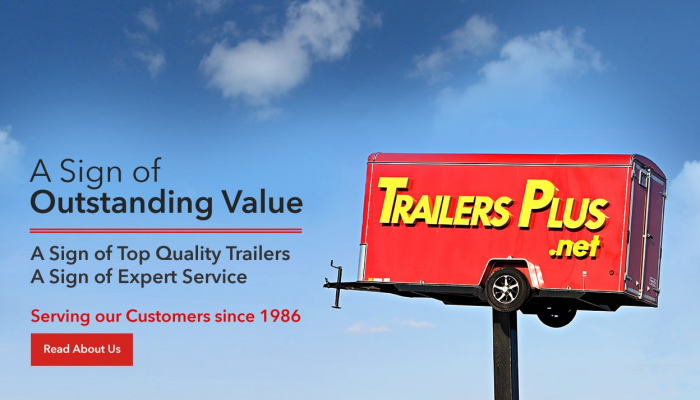 If you’ve heard or read anything at all about Trailers Plus, you already know how we pride ourselves on our professional trailer sales & service. Read some of our customer testimonials to see what people are saying about us. We offer a complete lineup of trailers to Canadians including cargo trailers, dump trailers, utility trailers, equipment trailers, horse trailers, motorcycle, ATV and snowmobile trailers. We also are proud to have one of Ontario's largest inventory of pre-owned trailers. If you are looking for a custom built trailer, we can work with you on a custom build that will suit your specific needs. Take a look around our website to learn more about Canada trailers from Trailers Plus. Have a look at our gallery, directions on how to find us, and our contact information. While our home is right here in Peterborough, Ontario we do offer trailer sales throughout Canada and can guarantee that you will not find better service anywhere in the country.